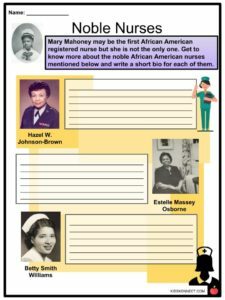 Mary Mahoney was the first African American to be a professionally trained nurse in the United States. 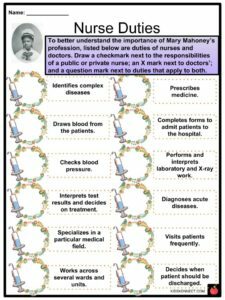 Mary Mahoney was the first African American to be a professionally trained nurse in the United States. In a predominantly white profession, she was able to graduate as one of the first African Americans to finish nursing school. 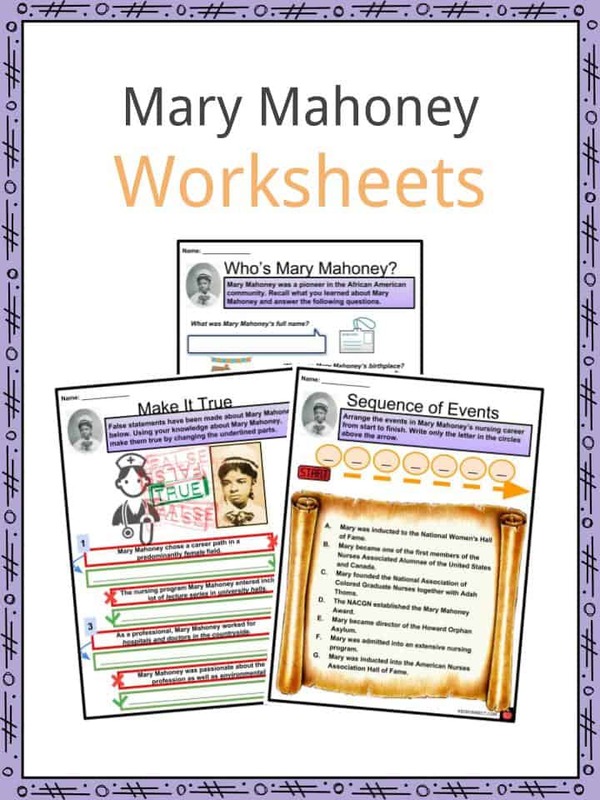 See the fact file below for more information on the Mary Mahoney or alternatively, you can download our 23-page Mary Mahoney worksheet pack to utilise within the classroom or home environment. Mary Eliza Mahoney was born to Charles and Mary Jane Stewart Mahoney on May 7, 1845 in Dorchester, Massachusetts. Mahoney’s parents originally lived in North Carolina but before Civil War took place, they moved to the north in pursuit of a place where they would face less racial discrimination. 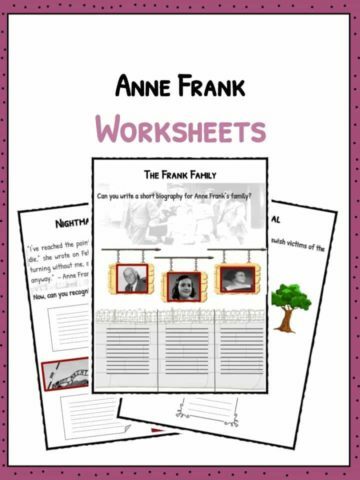 Mary was the eldest child and had one sister and one brother. Mary was a devout baptist and attended the People’s Baptist Church in Roxbury, Boston, Massachusetts. At 10 years old, Mahoney was admitted into the Phillips School, one of Boston’s first integrated schools. 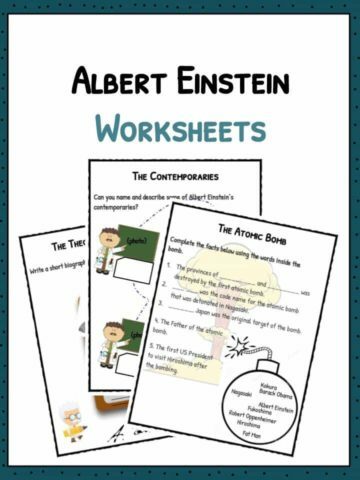 She attended Phillips School from first to fourth grade. She developed her interest in nursing while in Phillips School. 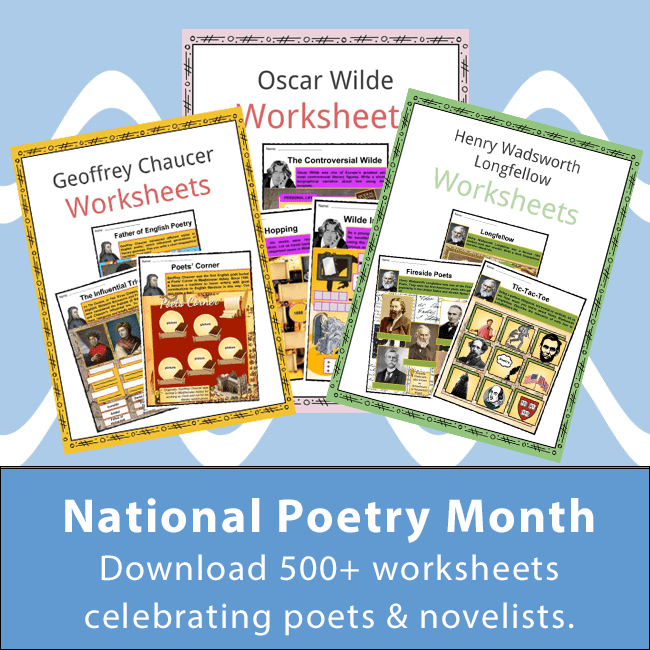 At 33 years old, she was granted admission into an extensive 16-month program at the New England Hospital for Women and Children (NEHWC) in 1878. The healthcare field was dominated by men and the NEHWC was the first hospital to offer such a program for women to pursue a career in the industry. The program accepted 40 applicants at a time and selected students between 21 and 31 years of age. Despite Mahoney’s age, she was admitted to the program because of her 15-years experience in the institution as a helper and cook which began when she was 18. As part of her program training, she had to spend at least a year observing and learning in different hospital wards to gain knowledge about nursing. She was also required to attend lectures and gain instruction through doctors in the wards. Daily work in the wards lasted from 5:30 AM to 9:30 PM. On top of receiving nursing education, Mahoney also worked as a private-duty nurse where she earned a weekly salary of 1 to 4 dollars for a few months. The last two months of the program required the student nurses to put their knowledge to good use in hospitals or family homes. Mahoney completed the program and graduated in 1879 as a registered nurse, together with three other colleagues. Mary Mahoney was the first black professional nurse in the United States. After graduation, Mahoney worked as a private care nurse for wealthy families. At the time, African American nurses were treated more as household helpers rather than professionals. Mahoney pushed for the distinguishing of the two professions. 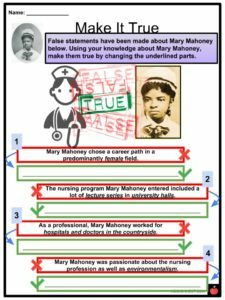 Mahoney also aimed to change the way African American nurses were perceived by patients. Her professionalism and shining reputation earned praise not only for her but for the black community. 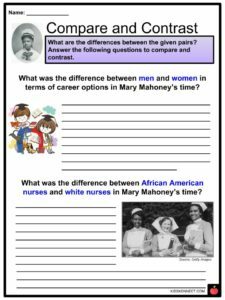 Mahoney helped raise the standards of nurses and the perception of minority groups. Mahoney became an in-demand private nurse as her reputation grew. Mahoney was the director of the Howard Orphan Asylum for black children and elderly in Long Island, New York from 1911 to 1912. In 1896, Mahoney became one of the first members of the Nurses Associated Alumnae of the United States and Canada (NAAUSC), which is now the American Nurses Association (ANA). Mary Mahoney and Adah Thoms founded the National Association of Colored Graduate Nurses (NACGN) in 1908. The NACGN was an organization that aimed to empower African-American registered nurses. The organization has had a huge impact in challenging racial discrimination in the field of professional nursing. In 1951, the NACGN merged with the American Nurses Association. In 1936, the NACGN established the Mary Mahoney Award, which is given to people who have significantly contributed to the advancement of diversity and equality in the nursing profession. 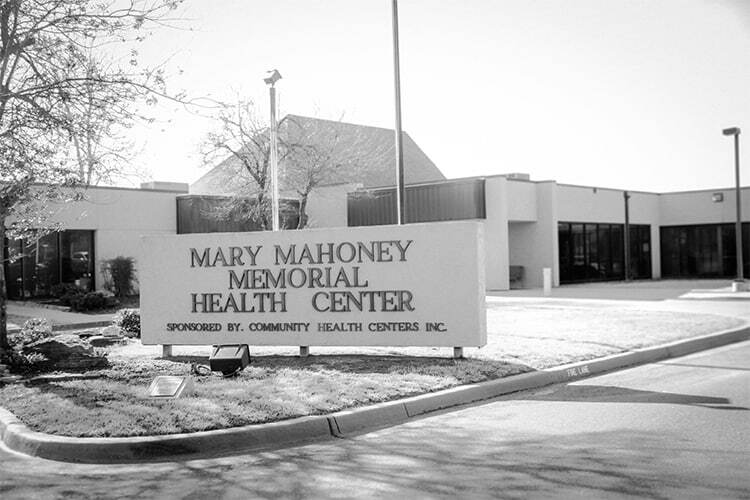 In 1976, Mahoney was inducted into the American Nurses Association Hall of Fame. In 1993, she was inducted to the National Women’s Hall of Fame. As a retired nurse, Mahoney was a strong advocate of women’s suffrage. She actively participated in civil rights activism. In 1920, she became one of the first women in Boston to register to vote. In 1923, Mahoney was diagnosed with breast cancer which she fought against for three years. She died on January 4, 1926 at 80 years old. She was honored with a monument after Helen Sullivan Miller, a recipient of the Mary E. Mahoney Medal, headed a campaign for its establishment in 1968. 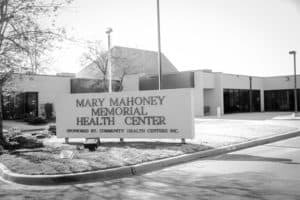 The Mary Mahoney Memorial Health Center in Oklahoma City and the Mary Eliza Mahoney Dialysis Center in Boston was named in honor of her. 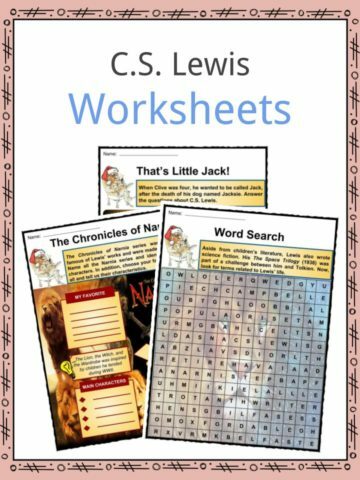 This is a fantastic bundle which includes everything you need to know about Mary Mahoney across 23 in-depth pages. 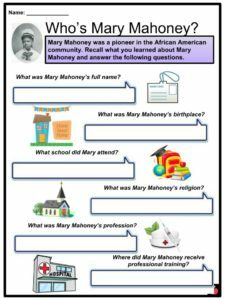 These are ready-to-use Mary Mahoney worksheets that are perfect for teaching students about Mary Mahoney who was the first African American to be a professionally trained nurse in the United States. In a predominantly white profession, she was able to graduate as one of the first African Americans to finish nursing school.